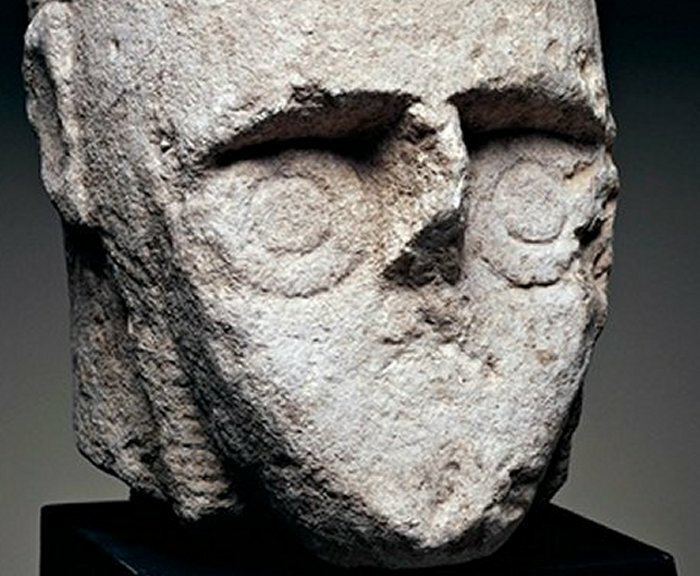 In 1974, remarkable ancient stone sculptures were accidentally discovered in farmland near Monte Prama, Sardinia. These huge statues are unique in size and material and very little is known about them. These mysterious ancient statues that do not resemble any ordinary humans, were deliberately hidden in the basement of a museum. It is commonly believed that they belong to the Nuragic civilisation, which flourished on Sardinia for two millennia until the second century AD. Excavations revealed 30 gigantic stone statues, about two meters high. The statues do not resemble ordinary humans. 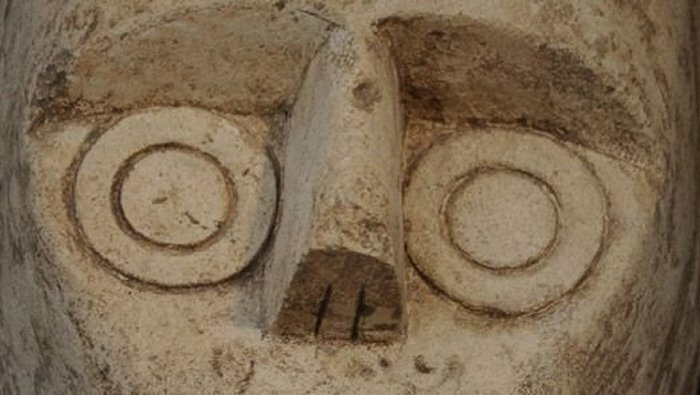 Instead, these mysterious ancient figures are distinguished by their unearthly eyes, which consist of two perfectly concentric circles and a very small almost invisible mouth. The giants of Monte Prama were given the name the “Kolossoi” by the archaeologist Giovanni Lilliu. They were discovered at a necropolis, so one theory is that the stone warriors guarded the tombs. However, it has also been suggested that they belonged to an as-yet undiscovered nearby temple. 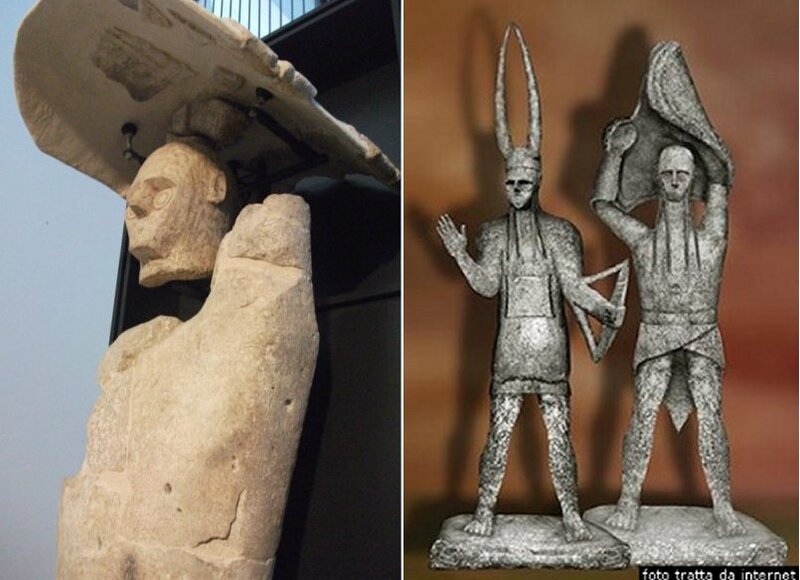 It’s the only group of sculpted life-sized warriors ever found in Europe. In some aspects, the figures remind of the famous Chinese terracotta warriors. However, their appearance and material differ. Compared to the terracotta warriors, the Sardinian Giants of Monte Prama are 500 years older and they are made of stone rather than pottery. 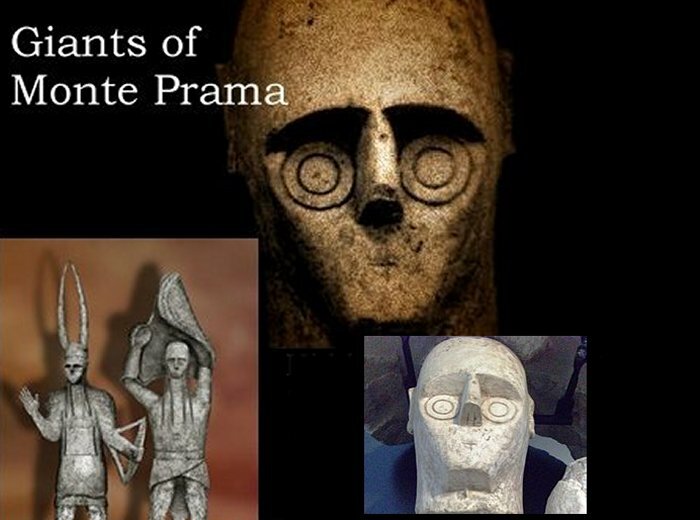 Giants of Monte Prama – Did the stone warriors guard tombs? The giants of Monte Prama are without doubt one of the most incredible and astonishing discoveries ever made on the Italian island of Sardinia. Yet, no research was done and there appeared to be no interest in these enigmatic 2,700-years-old ancient figures that some refer to as prehistoric cyber warriors. Unfortunately, shortly after the discovery, the giants of Monte Prama were “abandoned” for 32 years in the museum of Cagliari. They were placed in a damp and dark placement. It was not until recently that funds were set aside for the daunting task of reconstructing the statues, which also include representations of nuraghe, the tower-fortresses after which the Nuragic civilization is named. The figures were not found intact. Archaeologists discovered more than 5,000 pieces, including fifteen heads and twenty-two torso at the site, and it is unknown if everything has been found. It has been a great a demanding challenge to put together the pieces. 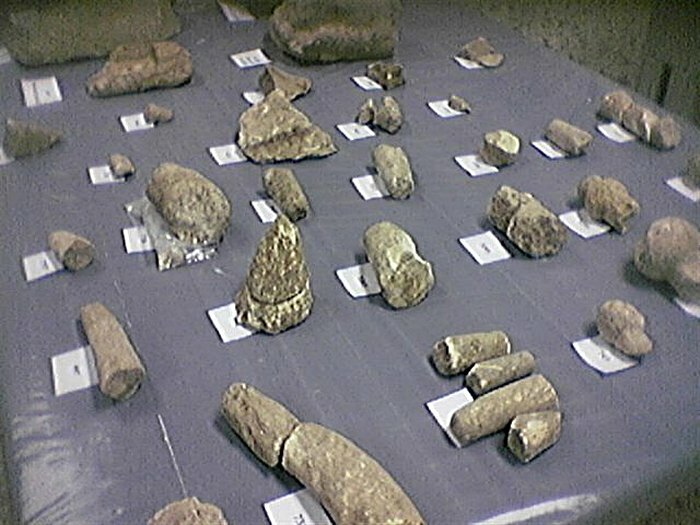 Fragmented into numerous pieces, it is believed that the fragments came from a total of forty-four statues. More than 5,000 pieces had to be put together to create the statues. “We don’t know how many there were altogether. Nor do we know if they were originally set out in lines or perhaps in squares,” said Alessandro Usai, the curator of the permanent exhibition, which opens on March 22, 2014 at the national archaeological museum, in Cagliari. The reconstruction, which was completed in 2011, took four years. Researchers carefully cleaned the pieces and re-assembled the warriors using supports rather than trying to glue the bits together with modern plaster and stone to make them look like they did when new. Twenty-five of the warriors are now intact once again and will go on display starting this summer at the Cagliari Museum in souther More than 5,000 pieces had to be put together to create the statues. There are three different types of fighters represented: 16 “boxers,” bearing shields over their heads, six archers and six other warriors, accessorized with bows, shields, swords, chest armour and horned helmets. Also re-assembled from the fragments are 13 models of nuraghe, massive conical stone castles built by the Nuragic culture. Usai said 28 of the works would go on show in Cagliari, while another 10 would be displayed in Cabras, where it is hoped the Giants will help promote tourism. Usai pointed out that the three-dimensional digital representations of the missing statues would be created at each site, “so that the two exhibitions will be complementary”. The giants of Monte Prama have been neglected for too long and it is most important that people are now finally allowed to see this valuable archaeological discovery. One cannot help wondering what these enigmatic beings with round eye used to represent..was it an “artistic” representation of human beings …maybe they represent an ancient earthly or extraterresrial civilisation ?